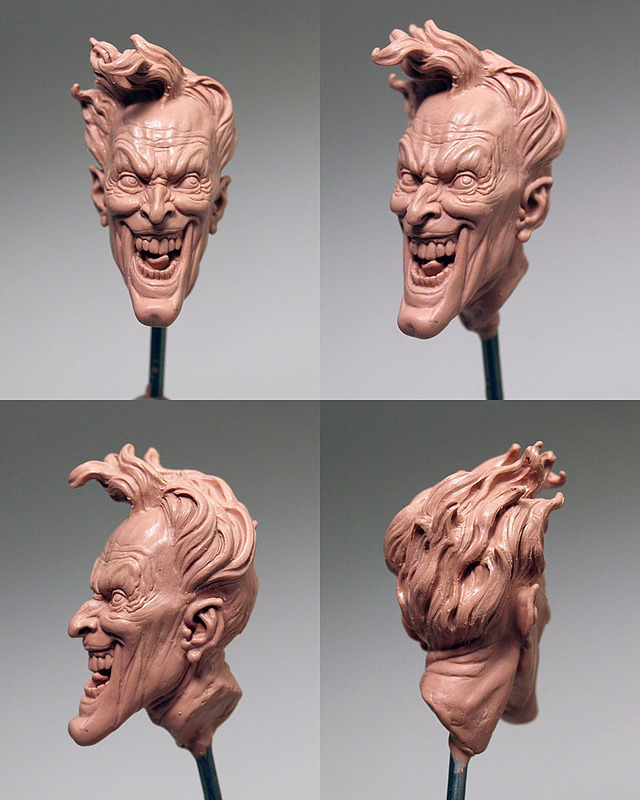 I’ve sculpted the Joker over a dozen times and I understand him better with each sculpture. I’m not sure that’s necessarily a good thing, now that I think about it. 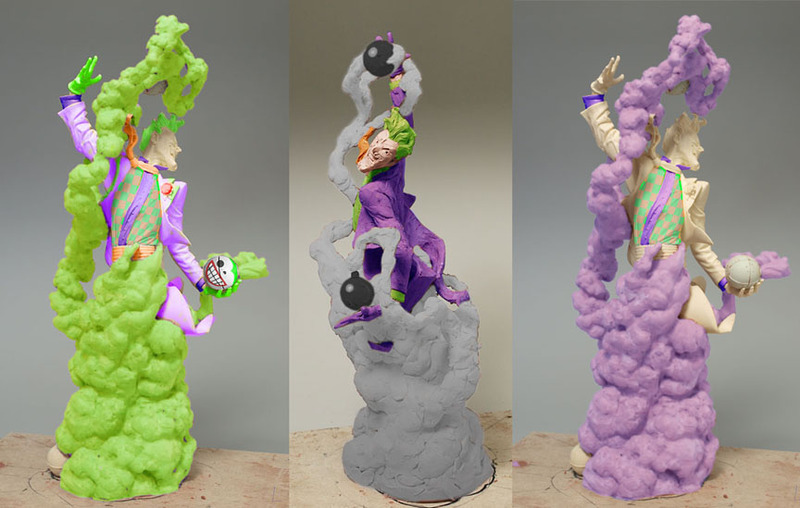 All but three have been translations of other artist’s work. 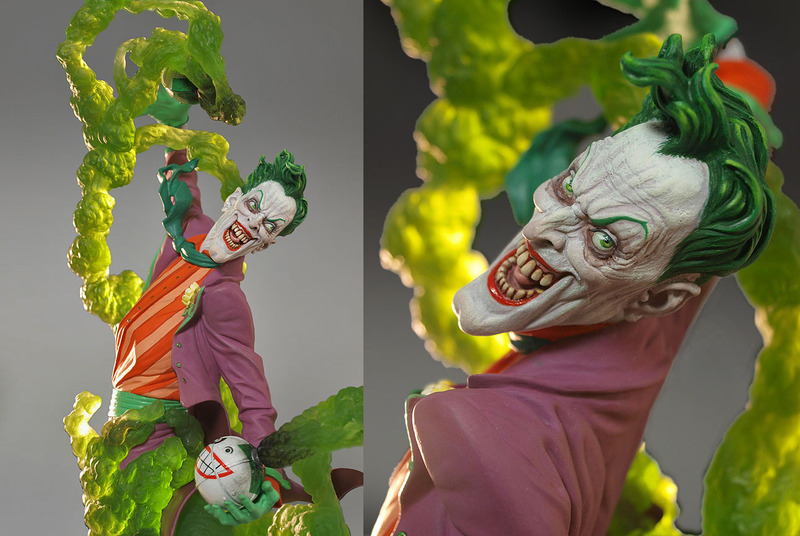 When I pitched the Dynamics line to DC Direct, I was pretty sure the Joker would be included. 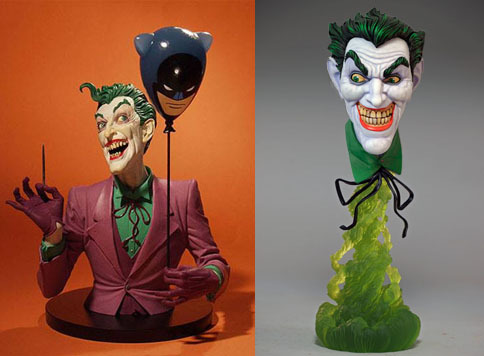 It was important that his design stand independently but it also needed to work well when paired with Batman, which had been completed earlier. I did some sketches. 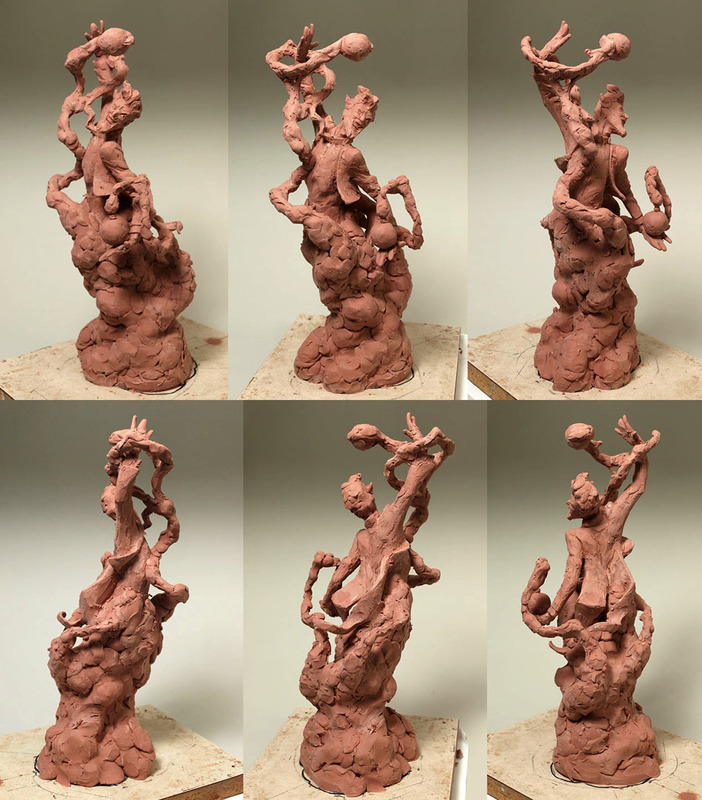 Got one approved and started roughing out clay. From the beginning I knew there’d be engineering issues I‘d have to contend with: Sectioning the smoke. Seating him into the cloud. Working the bombs into the smoke trails. Putting as much movement as possible into the piece and still have it be factory friendly. 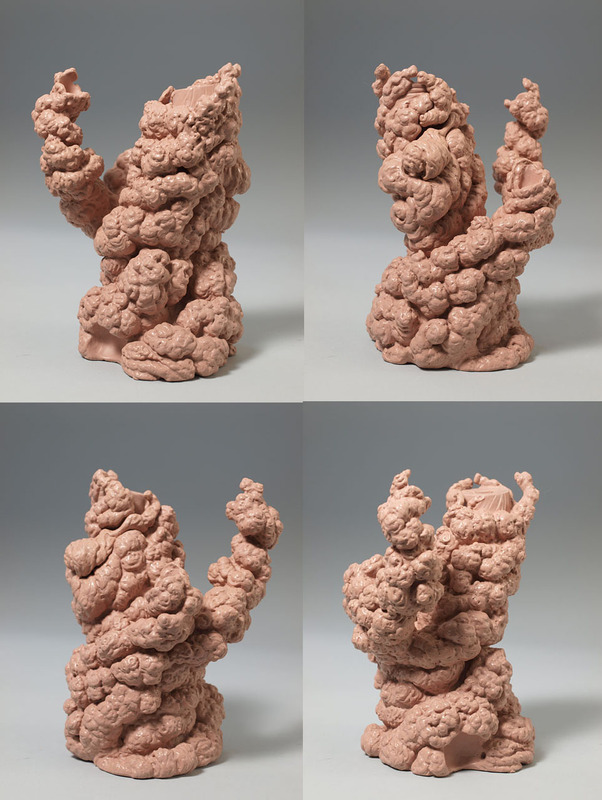 With the second pass at the clay, I solved a few more problems and refined the design. A potential problem when designing a sculpture that uses clear cast elements is how to support them without it looking obvious. 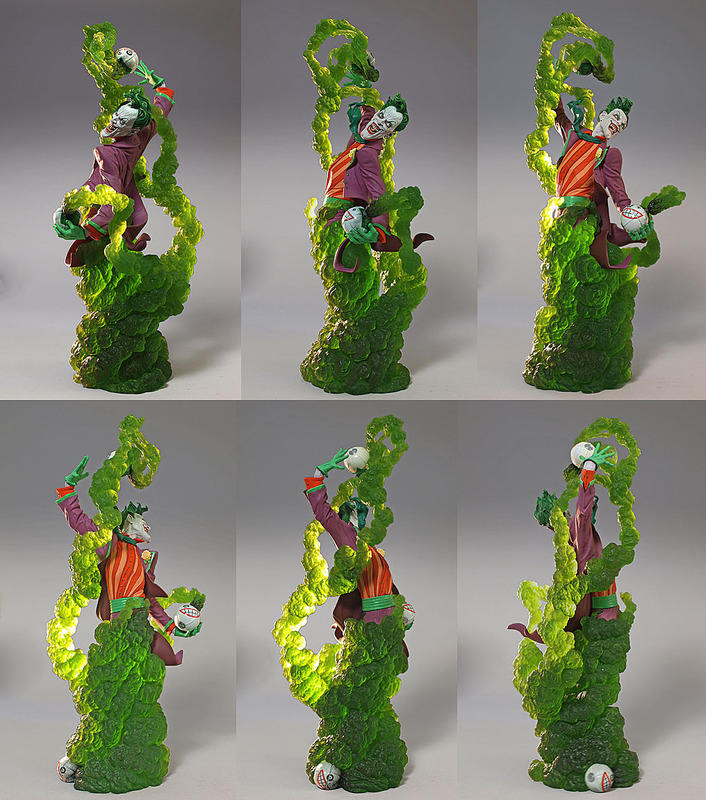 Commercially produced collectible sculpture is cast in a filled resin. This helps reduce the amount of resin and also adds stability. As all castable resins cure as a result of a chemical reaction (the two parts generating heat turning the liquid into a solid) a cured resin part is susceptible to heat warp if exposed to elevated temperatures. The filled resin is much more resistant to heat warp. But clear cast resin, filler-free, is prone to warp if not engineer against it. 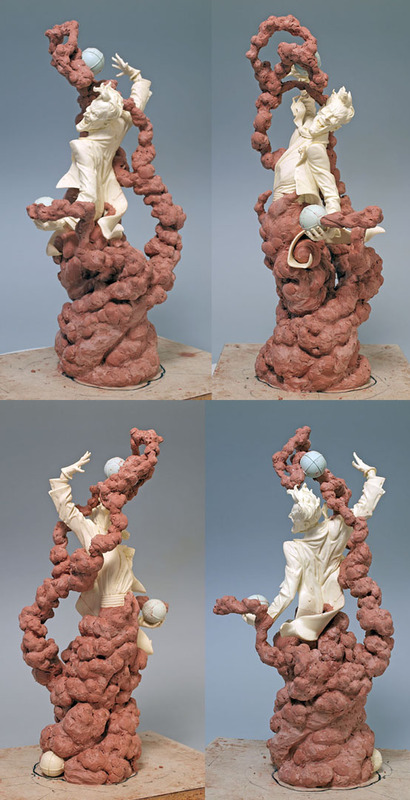 A set of waste molds were made of the clay and wax work begun. I almost always start with the portrait. It informs the rest of the piece in significant ways. 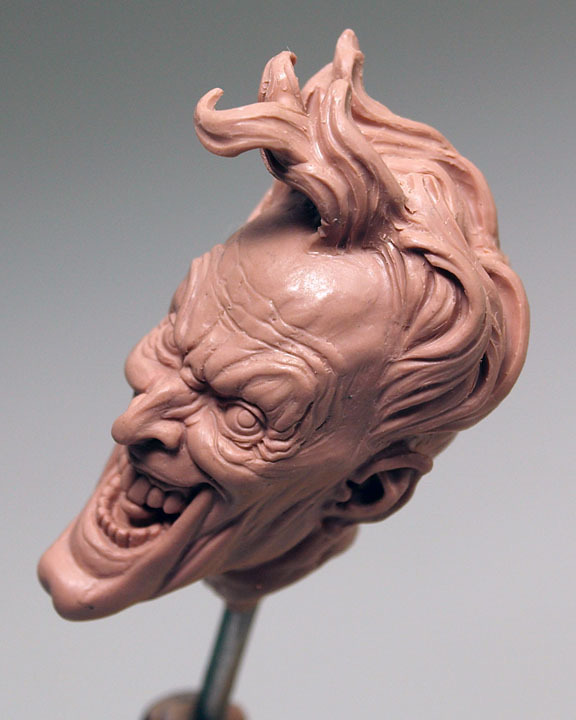 My take on the Joker is that he so delights in his evilness, he can almost taste it. Then it was onto his body. His torso needed to be plugged onto his waste which was part of the base, so I engineered a peg system to make sure the parts aligned reliably. His tie and hands needed to be separate parts. I used 20 gauge wax sheet for his tux tails to make sure they were of a consistent thickness. 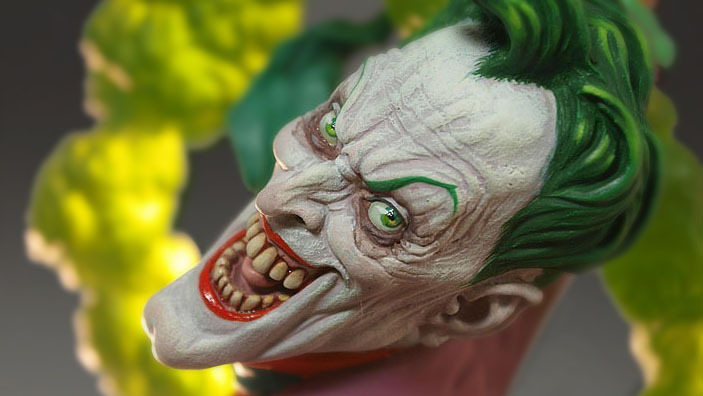 I envision the Joker as being profoundly vain. Everything he touches needs to be personalized to him and that goes for his poison gas bombs. 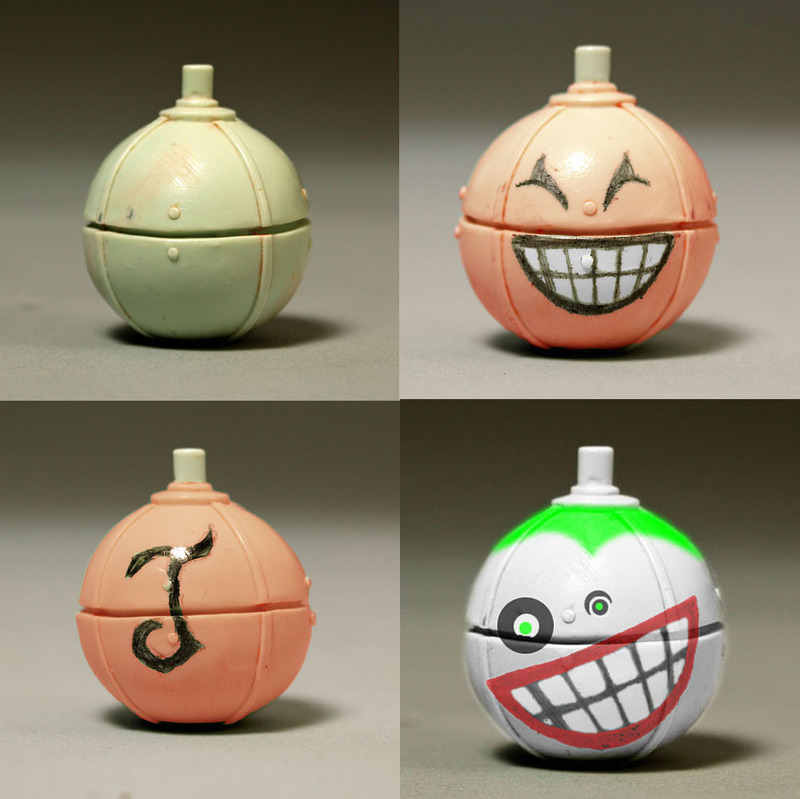 We played with a few designs It was Jim Fletcher, my Art Director, who worked with me on the Joker Face art for the bombs. 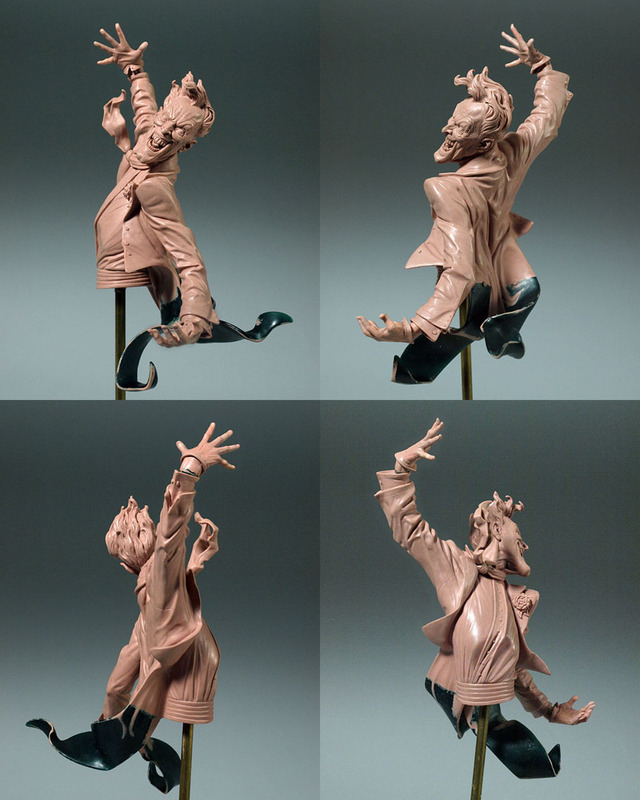 With the Joker figure done in wax and cast in resin, I refined the clay of the smoke base. The base was engineered to be reproduced in six parts. I played in Photoshop, working up color variations. Time to work the wax for the base. 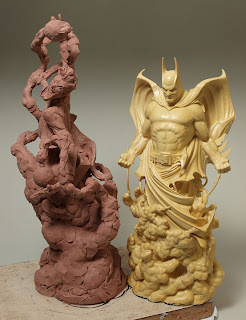 I’ve discussed sculpting for clear cast parts before. 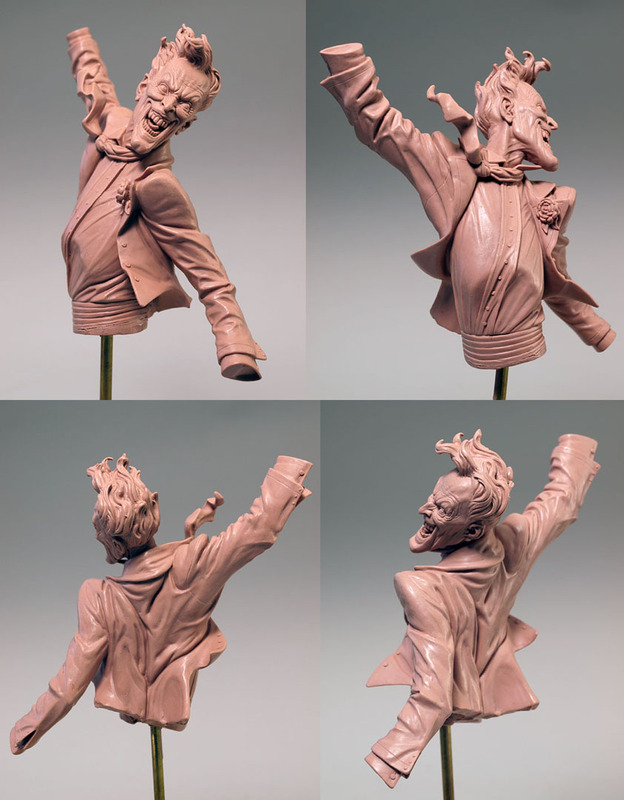 The key is to always reference all sides of the sculpt in relation to each other to maximize the play of light through them. This is the foundation of the base. With all the wax work done, it was time for master molds and resins for the Paint Master. I was given an unusual amount of freedom in re-designing the costumes for all the characters in the Dynamics line. And none more than the Joker, from the green piping on his lapels to his two-tone tangerine striped shirt. This piece remains one of my favorite commercial pieces. Thank you Jim and Shawn for the opportunity to bring him to life.